Hidenobu Ito is not really known in Europe, although he already has a list of releases to show… but on the other side of the world – in Japan. Hidenobu grew up in Inagi City, a municipality of Tokyo. Since his childhood he has been interested in game and experimental music. So, he started working as a cartoonist to afford his own music equipment. In the 1990’s, he began producing his first tracks, music compilation albums and soundtracks. Up to now, Hidenobu Ito released his music on labels, such as flyrec, Elegantdisc, NS-com, TripTrap, subrosa, etc. The first contact to the Mo’s Ferry Crew was his track „lover“ on the third series of the 10“ label fenou. After that one of his tracks had been included on the Mo’s Ferry Prod. „25“ last year. 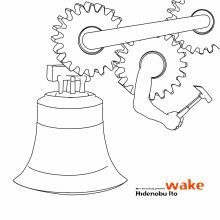 Now, there’s his first solo release on the Label called „wake“. The title track is definitely helping to find a proper genre for this EP (like Minimal), but it already shows Hidenobu’s vision to include no „out- of-the-box“ samples, but experimental and organic snippets. „voicedelique“ and even more „micro2“ are better examples to show that. B1 is a remix by Krikor, the perfect matching artist for this EP. He made a piece that still contains the weirdness of the original but has a little more punch.